I always like the idea of mince pies but in recent years have steered away from shop bought samples. Too much pastry, too sweet, generally too much of what you don't want and not enough of what you do - a rich fruity spicy filling with melt in your mouth pastry. A reason for never making my own was a slight aversion to suet and lard - saturated animal fats in my pastries is not an altogether attractive prospect and vegetable suet is not an everyday ingredient. Thankfully my local health food shop, Coopers on Lower Marsh, had the foresight to stock up on it ready for the onslaught of seasonal culinary delights. So no more excuse. At times like this Delia usually seems the best place to start - like asking mum. My battered copy of Delia Smith's Complete Cookery Course is the 1995 version - and 36th print edition since it was first published in 1978, and who knows how many more since? But one thing is certain that there are a lot of people out there looking to Delia for advice. Her recipes are no nonsense and usually deliver - especially on the baking front. Her interview in the Guardian this weekend struck a chord. When asked: If you could bring something extinct back to life, what would you choose? Restaurants that are run by real cooks serving real food, and not what Elizabeth David called "theatre on a plate". Well said. I like to think of the theatre as taking place in my mouth - food that has been so finically fingered to produce a fine dining version of a meal is a spectacle to behold not an everyday occurrence. Fashion dictates that this is the model we should all be aspiring towards unless of course you are Giorgio Locatelli trying to find a new angle for your cooking - so hey la cucina povera and Sicilian Cooking, but that's another thought. Getting back to mince pies. Delia's recipe makes 2.75kg of mincemeat - I thought this was a lot until I started eating them and now can see another batch being made before the festive season even begins! I think the real secret is rolling your pastry really, really thin and putting as much mincemeat as you can without them overspilling! 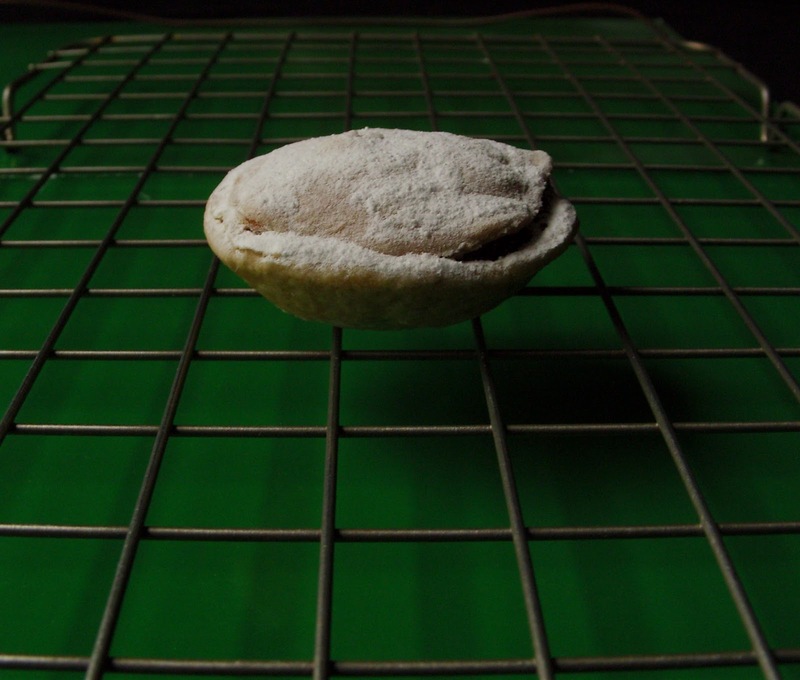 So with Delia's recipe as the start point this is my version and its called Twelve to one Mince Pies because literally as soon as you make them they all get gobbled up - this little fellow only survived as he was requisitioned for modelling duties! I like my mincemeat - well minced really, so that means a little more work and chopping up all the dried fruit. I also like almonds so I've added extra but as with all recipes adapt to your own taste. So all you have to do is mix up very well all the ingredients - excluding the brandy, in a large bowl. Cover with a clean tea towel and leave for 12 hours for all the flavours to meld in together. Then transfer to a large baking tin, cover loosely with foil and place in the oven at 120 Celsius for 3 hours. As Delia says 'this process slowly melts the suet which coats the other ingredients, and prevents fermentation taking place if too much juice seeps from the apples during storage.' Allow to cool, then stir in the brandy and spoon into sterilised jars and seal. This makes enough pastry for 36 mince pies but you can divide it in 3 and keep in the fridge then just make up as and when you like/need/fancy! Make the pastry by rubbing the butter into the flour and salt in a large mixing bowl. Easy in a food processor but if doing by hand just make sure that you don't over work the pastry - minimal rubbing in - so it looks like large breadcrumbs. Then add cold water a little at a time - just enough to bring the pastry together - I pour the mixture onto a length of cling film and draw it altogether into a tight ball, that way avoiding manhandling the pastry too much and then pop it in the fridge for minimum half an hour. For 12 mince pies roll out a third of the pastry as thin as possible and cut 24 rounds - pastry cutters are good or a glass the right size is fine also. Lightly grease a baking tray - line with pastry, fill with as much mincemeat as you dare. Dampen the circumference of the remaining rounds and press firmly to seal the edges. Brush with milk and make 3 snips with a pair of scissors in each pie. Cook near top of oven for 18 minutes or until they are golden brown. Cool on a wire tray and then dust with icing sugar. Twelve to one - all gone! Quince, Cabbage, Melon and Cucumber, Juán Sanchez Cotán circa 1600, Oil on canvas 69.2 x 85.1 cm. San Diego Museum of Art. The quince is a fabled and ancient fruit playing a host of different roles; from original sin in the Garden of Eden - theological interpretations of ancient texts suggest it could have been the quince that tempted Eve as opposed to its much maligned cousin, to its multifarious medicinal properties as a cure for numerous conditions - from pneumonia and lung disease, to colds and coughs. 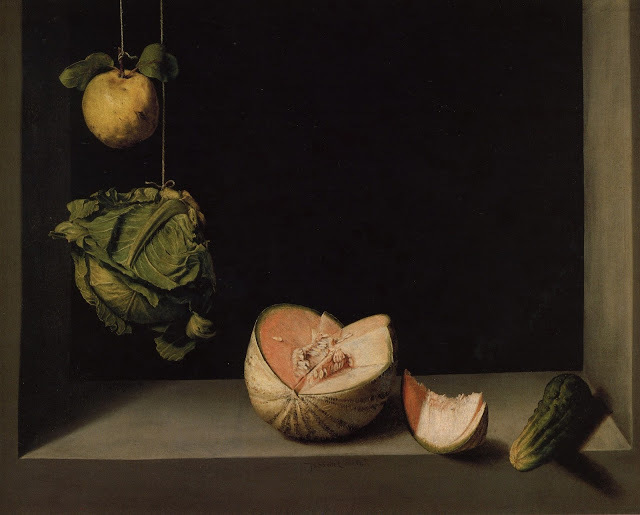 Before giving up his studio to become a Carthusian monk, the Spanish Baroque artist, Juán Sanchez Cotán, painted, amongst other things, still life. His compositions were ascetic and minimal and so rendered his chosen objects with spectacular detail. The relation proposed by Cotán between the viewer and the foodstuffs, so meticulously displayed might be described as anorexic, taking the word in its literal and Greek sense as meaning 'without desire'. Fruit and vegetables are suspended in space, framed by the black void, devoid of human contact and divorced from any notion of appetite or consumption - their value goes beyond that of mere nourishment. By imbuing the ordinary and the overlooked with such exacting detail, by imbibing foodstuffs with the care and expertise of his craftsmanship, (that at that time was usually only afforded to the megalographic subjects of the court and the divine) Cotán's version of the hyper-real can be seen to 'persuade vision to shed its worldly education'- that is to question what society deems spectacular and consequently what the eye has been trained to ignore and pay attention to the otherwise overlooked. 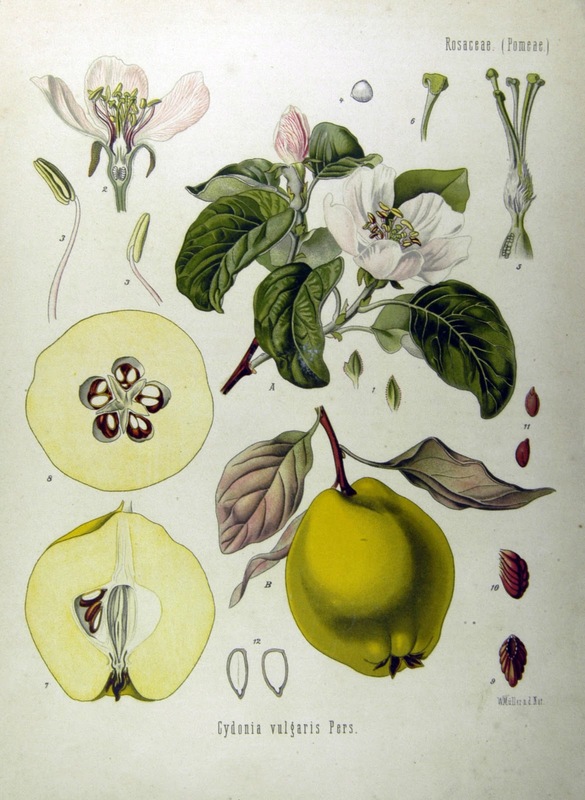 The quince has now become a relative stranger to the British eye and palate but the subtlety of its delicate flavour once cooked to a rosy amber hue, to produce quince cheese or membrillo, is a perfect foil for strong cheese and cooked meats. 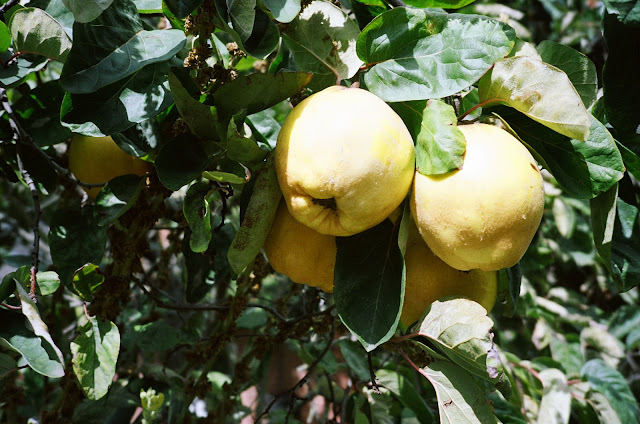 Core and quarter the quinces – there’s no need to peel them. Put them in a large saucepan with just enough water to cover. Simmer gently until the flesh is really soft and collapsing. Pour the fruit into a blender and puree. Push the mixture through a sieve with the back of a wooden spoon. Measure the purée – there should be just under 1 litre. Put the purée back in the pan with 450g sugar for every 600ml of purée. Heat gently, stirring from time to time to help the sugar dissolve, then bring to the boil and cook gently for 30–40 minutes or until the mixture is so thick that if you scrape a wooden spoon through it, the purée parts and leaves a clean line at the bottom of the pan. Spread the mixture into lightly oiled dishes or moulds, or pot in clean, sterilised jars. The membrillo will set firm as it cools and will keep for up to 6 months in the fridge.